Licensure, first of all, is the mark of a professional. The licensure process demands an extra measure of competence and dedication. While not all engineers find licensure mandatory for their chosen career paths, the PE initials after their names can provide many advantages. Employers in all disciplines indicate that they find licensed professional engineer employees to be more dedicated, with enhanced leadership and management skills. These employers look to licensure in evaluating the advancement potential of employees. Licensed engineers also achieve an enhanced status in the eyes of the public, which equates the engineer with professionals licensed in other fields. Licensure is an indicator of dedication to integrity, hard work, and creativity, and an assurance that the individual engineer has passed at least a minimum screen of competence. Of course, licensure is just a starting point for professional growth and development, and participation in professional activities is part of the ongoing activities of a true professional. Licensure for individuals who wish to pursue a career as a consulting engineer or a private practitioner is not something that is merely desirable; it is a legal requirement for those who are in responsible charge of work, be they principals or employees. Licensure for engineers in government has become increasingly significant. Many federal, state, and municipal agencies require that certain governmental engineering positions, particularly those considered higher level and responsible positions, be filled only by licensed professional engineers. For those considering a career in education, many states have been increasingly requiring that those individuals teaching engineering must be licensed. Exemptions to state laws are under attack, and in the future, those in education, as well as industry and government, may need to be licensed to practice. Also, licensure helps educators prepare students for their future in engineering. With the growing complexity and the increasing diversity of modern construction processes and techniques, the engineer in construction must readily be able to communicate and exchange ideas and views with other licensed design engineers. For those pursuing careers in industry, licensure has recently taken on increased meaning with heightened public attention concerning product safety, environmental issues, and design defects. Employers have found it advantageous to identify to the courts and the public those employees who have met at least a minimum level of competence. Engineers in the military must have the credentials to stay with the service in the face of downsizing or to make the transition to the private sector. The scope of engineering practice is constantly changing, and engineering activities that may be exempt today may eventually shift into a practice area that one day requires a license (for example, research and development may find practical application in the facilities design/construction process, requiring the practitioner to be licensed). 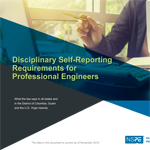 State engineering boards are increasingly seeking and obtaining the authority to impose civil penalties against unlicensed individuals who unlawfully engage in the practice of engineering. Engineers must adapt to a rapidly changing workplace-restructuring, downsizing, outsourcing, privatization, and re-engineering. Engineers should prepare to make the transition into a consulting relationship with former employers and clients in the event of a corporate outsourcing and respond if their corporation decides to bring design and engineering services in-house. Only by becoming licensed can an engineer perform the broad scope of engineering services within an area of competence as defined under state law.